Based on the manner in which some political progressives frame their critique of capitalism, one could reasonably form the opinion that there are benign or redeeming forms of capitalism. Let’s make this clear, all forms of capitalism are unacceptable and revolting to justice, solidarity and equity. There are moments when critics denounce “unfettered capitalism,” “corporate capitalism,” “crony capitalism,” “finance or financial capitalism” or “unregulated capitalism” as the source of the current economic and social exploitation experienced by the masses or societies across the globe. “Klein deserves enormous credit for putting capitalism in the dock. Yet she leaves too much wiggle room for capitalism to escape a definitive condemnation. There is already great confusion and division among social activists over what “anti-capitalism” means. For many if not most, it is not the capitalist system that is at issue but particular sub-categories of villains: big business, banks, foreign companies, multinationals. 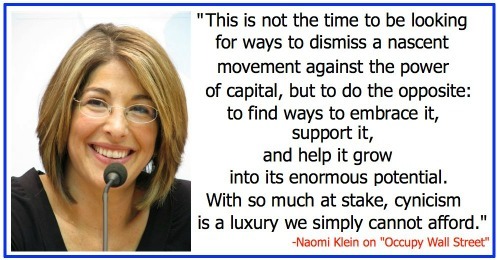 Many individuals and organizations have taken the above pragmatic approach to critiquing capitalism, because we do not want to come across, in the eyes of the people and the ruling elite, as too radical, irresponsible or “ideological.” In the case of the Occupy Movement, the use of its widely popular slogan “We are the 99%” pandered to the ruling-class’s ideological bill of goods that Europe and North America are predominantly middle-class regions with the working-class being a minority. The 99% category feeds into the narrative of a largely middle-class population being confronted with greedy bosses and politicians who have deviated from the social and economic practices that defined the golden age (1945-1974) of the capitalist social welfare state. With the capitalist ruling-class reduced to a mere 1% of society and isolated as the specter haunting the rest of us, the working-class and liberal petty bourgeoisie were not forced to confront and interrogate their own ideological support for capitalism. The ruling-class has imposed its economic and political ideologies onto the consciousness of the oppressed as natural, self-evident ways of seeing reality. It is only an uncritical grasp of political economy or an underdeveloped class analysis that would put Barack Obama, the Supreme Court justices, all members of Congress and even many chief executive officers within the ranks of Fanon’s “wretched of the earth.” How is it possible for the political and economic foxes of American capitalism (ruling-class elements) to be placed in the same henhouse as the chickens (the 99%)? We do not need to wonder about the identity of the group that is going to end up as breakfast, lunch or dinner in such a Kumbaya-like scenario!